… in several industrial installations, to be an enhancement of the heat transfer by radiation, due to the higher flame temperature. Both requirements have been met through the design of O2-NG burners with flat flame and separated injectors of Oxygen, that allow to modify the flame shape and subsequently also the NOx generated. 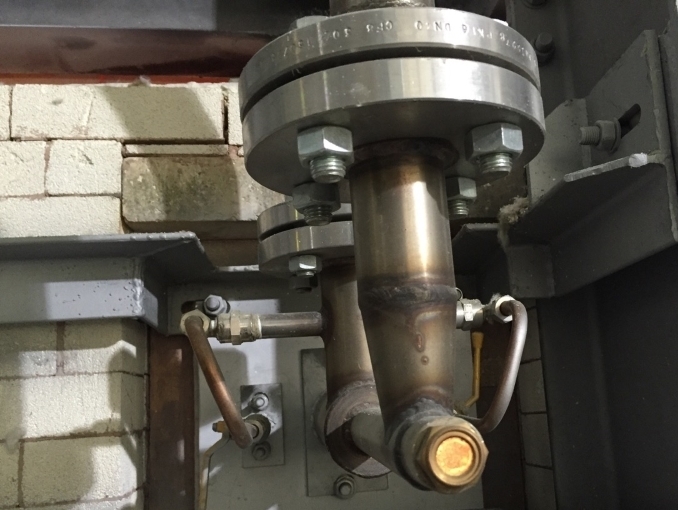 These burners can be used both with gaseous fuels (NG, LPG, Propane) or liquid fuels (HFO, LFO or Diesel) and can be tailored to any application and furnace size. Oxygen and Fuel are mixed outside the burners as both are injected into the furnace by two separate patterns. This design creates a longer flame and reduces the flame temperature increasing the surface coverage. The burner structure is realized in stainless steel with separate and adjustable inlet of fuel and oxygen. The burner is design includes also the AZS burner blocks which are integral part of the part of the system and designed to enhance the flame characteristics. If used in combination with our oxy-fuel combustion systems, with separate regulation of each power setup, the burners ensure to the furnace high efficiency heat transfer, easy operation and maintenance, low refractory wear and long life.